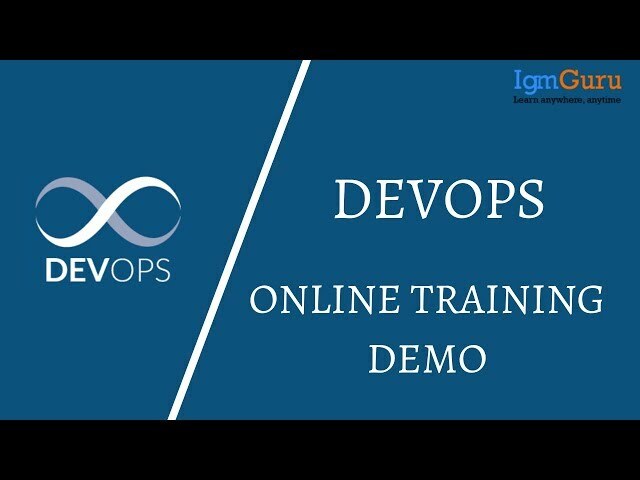 IgmGuru's DevOps Online instructional class can set you up for a vocation in DevOps, the forceful field that crosses over any barrier between programming framework engineers and activities. You'll wind up talented inside the standards of consistent advancement and preparing, computerization of arrangement administration, between group coordinated effort and IT benefit nimbleness, utilizing present day DevOps devices like git, Docker, Jenkins, Puppet, and Nagios. IgmGuru's DevOps web-based instructional class is intended to enable you to end up a DevOps professional and apply the most recent in DevOps approach to mechanize your product improvement lifecycle appropriate out of the class. You will ace setup administration; constant combination organization, conveyance, and checking to utilize DevOps instruments, for example, Git, Docker, Jenkins, Puppet, and Nagios in a viable, hands-on and intelligent methodology. The DevOps instructional class centers intensely around the utilization of Docker compartments, an innovation that is reforming the manner in which applications are sent in the cloud today. The capacity to robotize all parts of a cutting-edge code conveyance and sending pipeline utilizing different apparatuses. Who should opt for DevOps Online Training course? Learning of programming advancement, ideally in Java, and the UNIX/Linux direction line instruments are basic for this course. Lesson 1 - What is DevOps? What are its components? 1.1 Agile and DevOps: How do they interrelate? 4.1 What are containers? Why are they used? What do I have to do to open my IgmGuru endorsement? To go to one finish group for the DevOps web-based preparing.